Reporting using unlimited custom reports and a single dashboard for management so you can review sales performance and really see whats working and whats not. Predictive Lead Scoring to help you connect with more of the right kinds of prospects and make better use of your sales teams time. Note that HubSpot are changing the pricing structure for Sales Pro and if you purchase ahead of November 1st you will get it at the current price. The new pricing policy can be found here. 'Its all about 1:1 conversations'. That was the message. 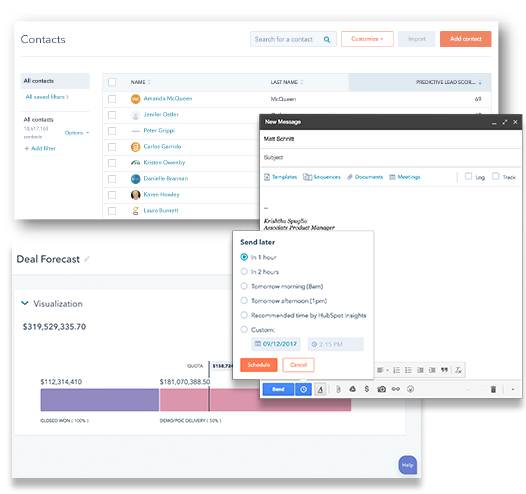 HubSpot Conversations is being added to the HubSpot CRM Free. 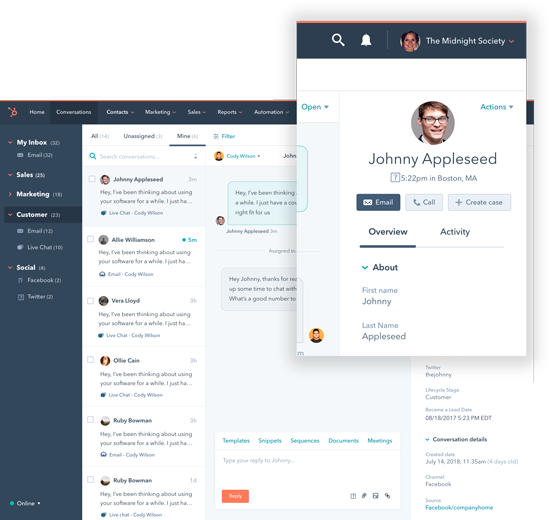 It is built for customer facing teams to help them manage live chat, email, social, messaging channels like slack etc and help your company growth via one-to-one messages. Conversations will be multi-channel, tied to your CRM (for full context) and scaleable with chat bots which you can built without being a techy that will allow you to easily respond to high volume inquiries. During the keynote, Dharmesh explained how HubSpot had been looking at their platform and realised that something was missing. That something was a Customer Hub. HubSpot have been working internally on tools for themselves over the years, to help improve their customer support, create customer success, get customer feedback etc and have now put all of this work towards creating the Customer Hub product. They recognise that there's a growing need for companies to support the entire customer experience so that it can be improved. Customers have higher expectations, more options and it's easy for them to make a switch. Given its a lot cheaper to keep existing customers than get new ones, delighting existing ones makes sense. Thats where the HubSpot Customer Hub comes into play. Customer Hub will help customers understand, respond and grow through the success of their own customers. It will not only help you keep them but it will help make them more successful and happier as a result. Quickly identify and respond to issues using churn forecasting and sentiment analysis. 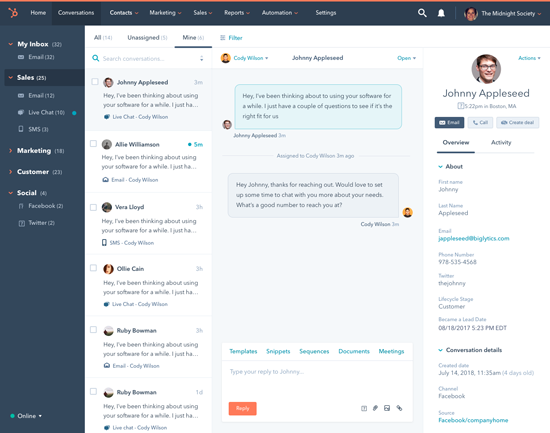 The great news is that the core functionality will be added to HubSpot CRM free! 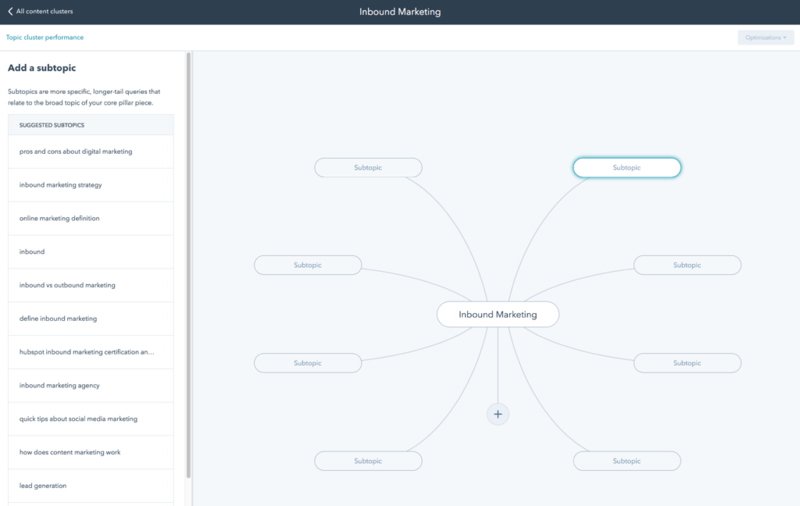 HubSpot announced a number of new features to their Marketing platform. 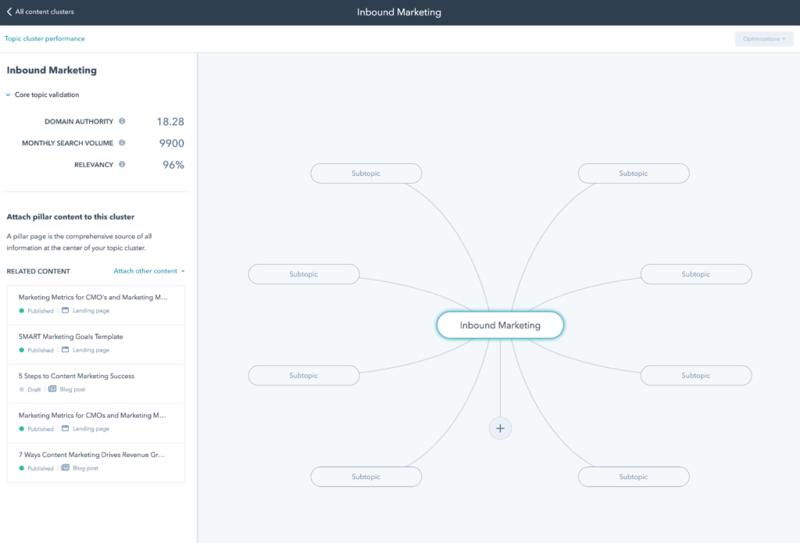 Search is changing and HubSpot have responded by adding the new Content Strategy module to HubSpot Marketing so that you can base your content strategy on topics rather than keywords. The idea behind it, is that instead of writing content to cover every exact keyword term you want to rank for, you create one piece of content that covers a topic instead. This will be the main authoritative source on that topic and then you can create supporting content around it. HubSpot have created the new Content Strategy tool to support this new way of organising and writing content. Once you set up a topic, HubSpot will gather related content from your site, suggest sub topics, help you organise your content etc It will also help you easily identify the content topics that are working the best for you — and the ones that aren’t so that you know that you need to take some action or revise your strategy. Here's a couple of screenshots showing what it looks like and how it helps validate core topics and suggests subtopics, content etc. It's interesting to note that HubSpot reports that some companies already using this approach are getting 4X leads than before. A significant increase. So if you want to get more traffic with less content then you need to try this. We've already started reworking ours and are loving this new feature and how easy it is to use! We all know that reporting is one of a marketers biggest challenges. 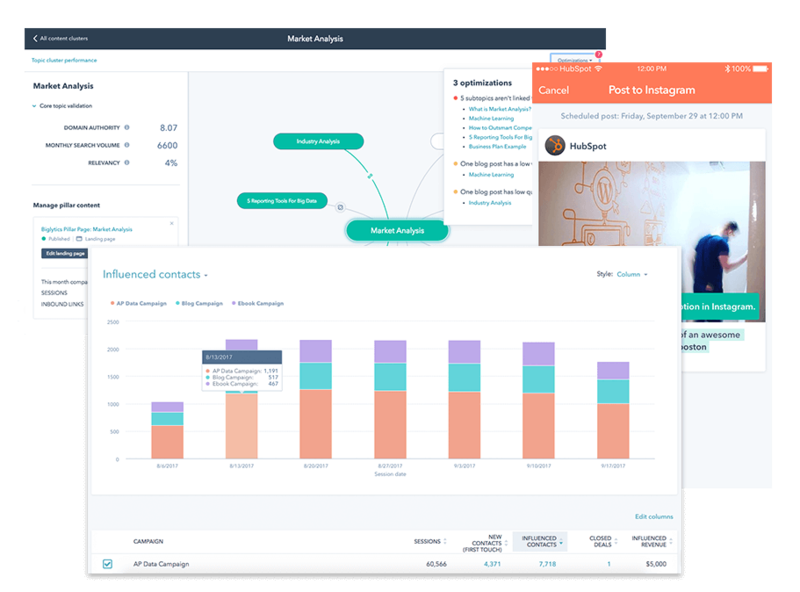 HubSpot are introducing a new reporting module for campaign reporting which will allow you to tie your campaigns to traffic, leads and most importantly, revenue. It will allow you to report on every component of a campaign from first touch to closed won. We currently have access to the beta version of Campaign Analytics and it looks like its going to provide massive benefits when it comes to reviewing and justifying spend across the entire campaign, channels etc. Track down how much revenue a campaign influenced. Attribute credit to all of the campaigns that influences its contacts along the way. Its simple to use too, once you create your campaign, HubSpot does the rest. Note that it looks like campaigns created before 1st September won't be included in the module and will remain on the current Campaigns report. HubSpot have also added various other reports that don't require the Add-On. All of these are available now for Basic, Pro and Enterprise customers. HubSpot have deepened their integration with Facebook. One change is the addition of a native integration with Facebook Lead Ads. Now, you can build Lead Ads from within HubSpot. Any leads generated will be added to HubSpot as contacts for a seamless and automated connection with your prospects. Here's HubSpots quick video explaining Lead Ads. 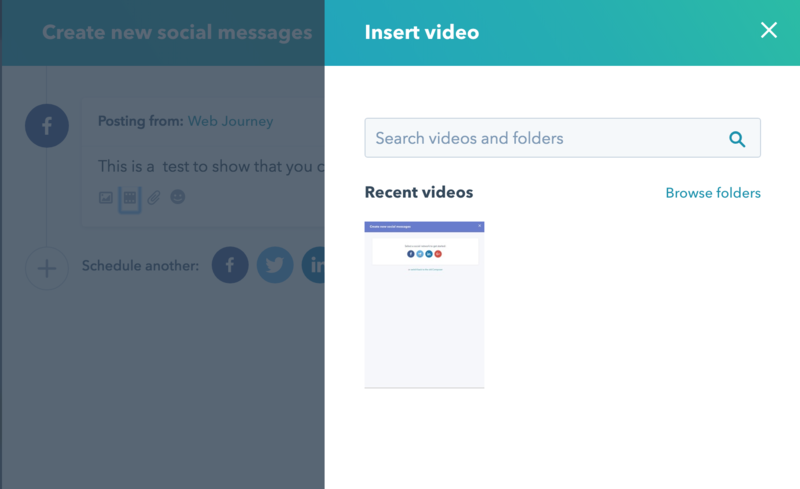 You can now post video to your Facebook Account from within HubSpot. Apart from the convenience of this, the other major benefit is that these posts will be included in your HubSpot reporting and you won't have gaps in your analytic's. You can use this to help you with ABM, bringing prospects further down the funnel as well as adding a targeted touch point. This functionality will be part of the Ads Add-On in HubSpot which currently costs $100 a month. HubSpot announced at Inbound17 that a new social feature called Instagram Reminders will be rolling out soon. Instagram doesn’t allow direct publishing from a third-party to their network so this new functionality will allow you to draft, schedule and publish content to Instagram from within HubSpot Marketing and a mobile app. You will have to schedule the posts inside HubSpot and then when its time to actually post you will get a push notification via the HubSpot mobile app. From there you will just open the app, copy and past the text into Instagram, and publish. Launch: Expected in December 2017. If you're using some other eCommerce platform don't worry, the Ecomm Bridge integration will help you connect your online stores to HubSpot. Launch: This is currently in a limited beta and will roll out over the coming months. Finally, a nifty little tool called HubSpot Collect was announced. It is a new Google Chrome extension which enables you to clip full pages, images etc from websites. You can then add them into blog posts with one click and it will automatically attribute the source back to the original link. Definitely one worth trying. Launch: Available now to download in Google Chrome. 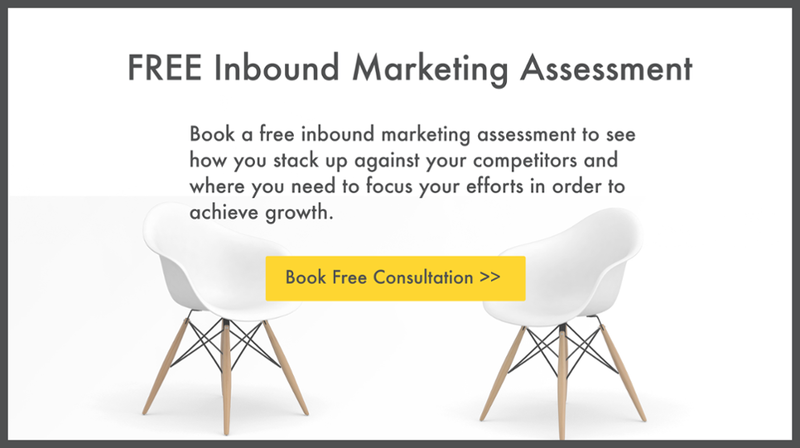 If you would like to know more about how Inbound Marketing can help your business meet its growth goals, then click below to book a Free Inbound Marketing Assessment.